Ready for an exhilarating and informative experience you and your students won’t soon forget? Academie Duello offers a rare opportunity to immerse your students in the learning process through a hands-on experience with European history and swordplay. At Academie Duello’s Field Trips program we offer lessons for students between the ages of 8 and 16 at your school or at our practice studio and historical museum in downtown Vancouver. Let your students interact with historical items in a safe and engaging environment. 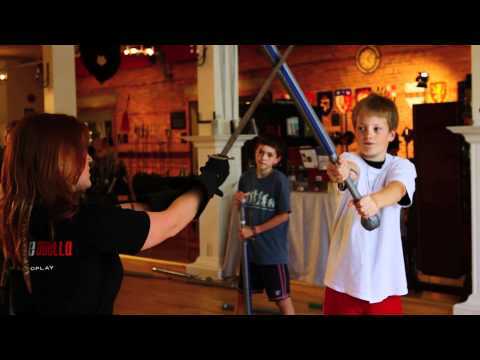 Teach your students the renaissance art of fencing with the rapier, longsword, and quarterstaff. Connect your students with history through presentation, lecture, and demonstration. Get kids moving, thinking, and interacting while they learn. We’ll work with you to customize any of our programs to meet your learning objectives and supplement your curriculum. An opportunity for your students to both study and interact with history. Historical artifacts and reproductions from swords, to armour, to coats of arms and more. The tools to excite your students about math, science, history, phys. ed. and other subjects. An inspiring way to meet your learning objectives. The most exciting field trip or classroom visit you’ll have this year!